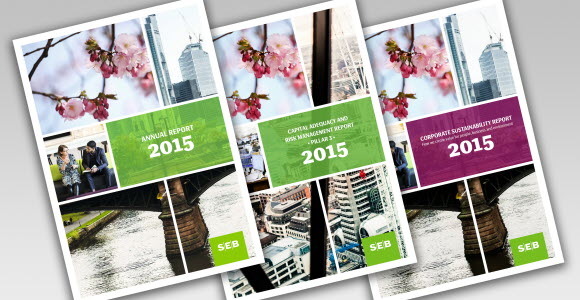 SEB's Annual Report, Corporate Sustainability Report and Capital Adequacy and Risk Management (Pillar 3) Report are now available on the bank's web site. The year 2015 was exceptional in many ways. A number of countries experienced negative interest rates, there was turbulence on the stock exchanges, credit spreads increased and commodity prices fell. The regulatory requirements on banks continued to change. At the same time geopolitical tension increased substantially. In this environment, customer demand for risk management services increased while large corporations' need for financing was limited. The small and medium-sized companies were somewhat more optimistic while private individuals moved their savings from equities to balanced funds and deposits. Digitisation is leading to rapid changes in customers' behaviour. During the year we met customer needs with a great number of new service offers. During 2015 the bank finalised the three-year business plan for 2013-2015 and formulated a road map for the future, Vision 2025. Engagement among employees increased for the third consecutive year. This and the new business plan are described in the Annual Report. 2015 was also an eventful year in terms of an increased agreement on the global challenges the world is facing and how we together can contribute to a sustainable society. As a bank we have an important role in this. Since 2008, SEB more than halved its own carbon dioxide emissions, but the bank has also been a driving force in the development of green bonds and has successfully established microfinance funds in the Nordic market. The Corporate Sustainability Report describes SEB's work and ambition to continue to create value by integrating sustainability in the business. The Capital Adequacy and Risk Management report describes SEB's current risk position in terms of its main risks, how these risks are managed and measured as well as more details on the capital position and capital adequacy.